Created a downloadable Calendar with all the date on there for easy planning. We’re curious if we should do this every year – will you let us know what you think by leaving a comment below or sharing it so we’ll know you found value in it. We think we made sharing easy using the buttons above and would appreciate your help getting the word out around Tampa Bay. Apollo Beach Boat Parade Route on the TSS site says the lighted boat parade will begin and end in the South channel and proceed towards the Lands End Marina before winding around Lake Sunrise Basin, back out and around Bal Harbor and then end up Flamingo Canal and go around Dolphin House at the end of Gran Kaymen Dr, then back out Flamingo Canal, across the front of Symphony Isles Beach and into Symphony Isles, down the canal between China Drive and Allegro Lane and finish at the south channel. This is a memorial boat parade is sponsored every year by the Island Estates Yacht Club to honor members of the club that passed that year. They have been doing this for over 40 years. Many of the Island Estates homeowners participate in the parade – there is no application fee to participate in the parade. Those participating will congregate their boats in the Mandalay Channel which is lined with luxury waterfront Island Estates condos (on the west side of Island Estates) between Island Estates and Clearwater Beach. Public Viewing Tip: The boat parade will also travel toward Coachman Park which is a great public place to catch the parade. 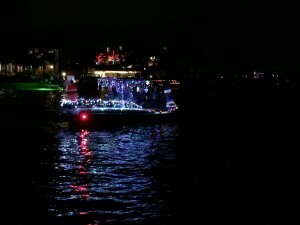 The Dunedin Holiday Boat Parade is always held the 1st Saturday in December. That makes it easier to plan for doesn’t it? This year start your holidays during this traditional waterfront celebration as decorated boats parade through the Dunedin Marina at approximately 7pm. The Public is invited to come enjoy holiday music and s’mores while waiting for Santa to arrive by boat and lead the countdown in the lighting of the City’s Christmas tree. Public Viewing Tip : There is Limited seating so please bring your own lawn chairs. You can see the boats come in and the tree lighting at Edgewater Park. The Rotary Club of FishHawk-Riverview will sponsors the Annual Alafia Lighted Boat Parade at 5 p.m. Saturday, Dec. 5, on the Alafia River at the International Independent Showmen’s Association, 6915 Riverview Drive, Riverview. The BCYC Lighted Christmas Boat Parade will be held Saturday Dec 12 starting at 6pm. Public Viewing Tip: The Christmas Boat Parade starts and ends at the Gulfport Municipal Marina. Parade Route: From the Gulfport Municipal Marina the boats will pass by the BCYC clubhouse on our way out into the bay. Next we head to Gulfport’s Williams Pier and the beach, passing by the Gulfport Casino. We make our way through the communities of Town Shores, Pelican Bay, Kipps Colony and the Pasadena Yacht & Country Club, where holiday parties wait for us to pass by. Lastly we visit Isla del Sol, then head back to the clubhouse for the Post Parade party. Public Viewing Tip: Jimmy Guana’s (401 2nd St Indian Rocks Beach Fl ) deck at the Holiday Inn Harbourside has the perfect view – just plan to get there early. 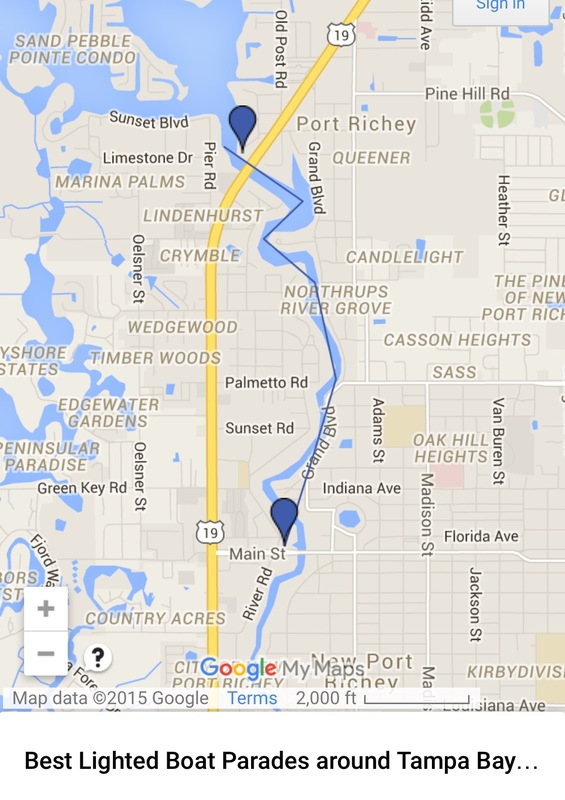 IRB Lighted Parade Boat Parade Route: Parade Starts at @ 7pm at the southern end of the Holiday Inn. Sail boats will be at the end of the line. The IRB Boat Parade will head north by the Holiday Inn dock, and then continue north under the Walsingham/SR 688 Bridge. The Bridge will remain open until all boats are clear. The Boat Parade will finish at the north end of the City Limit off Harbor Drive North. 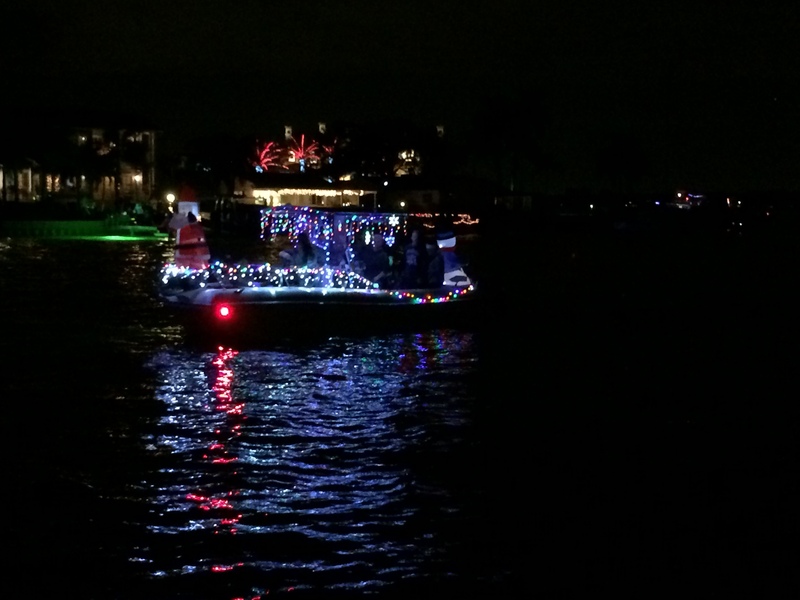 The Madeira Beach Boat Parade called the Festival of Lights will be on December 12th , 2015 6:30 – ? Parade Route: The Madeira Beach Boat parade will begin behind at Johns Pass at 6:30pm go up and down the canals including Crystal Island and the lighted boat parade will end at the Madeira Beach recreation field (200 Rex Place Madeira Beach Fl). River of Lights Christmas Boat Parade will be Saturday December 5th 2015 6:30pm ( It’s always held the first Saturday in December) The parade which started in 2000, has become a Holiday staple for the New Port Richey Main Street program. Public Viewing Tip: This annual nighttime boat parade finishes at Sims Park in downtown New Port Richey before heading back. 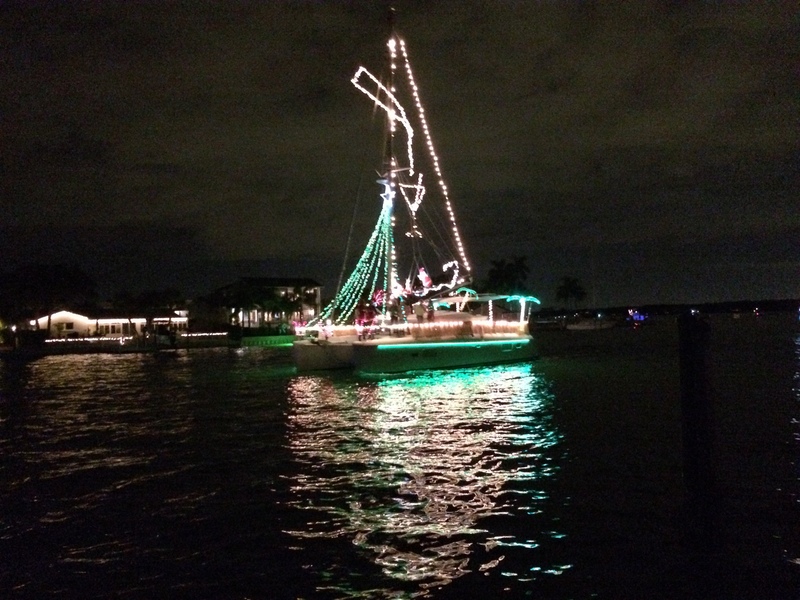 This boat parade is fun whether it is warm or cold – a very festive way to kick off the Holiday season here in New Port Richey whether you are watching from the shore or participating on a boat or kayak. This year the fun will continue after the parade at the Awards Ceremony and After Party hosted on Railroad Square (Nebraska Avenue between Grand and Adams) with vendors, live music and the award ceremony hosted on the Cavalaire Square stage. The last Boat Parade this year will be the Redington Beach / Indian Shores being held on Sunday December 20st 2015, 6:00pm to ?.This parade is sponsored, jointly, by the towns of Redington Beach, North Redington Beach, Redington Shores and Indian Shores. The Parade Route: The Parade starts at Tom Stewart Causeway Docking and it meanders into the creeks and canals that branch off the ICW, passing along the shoreline of each of the participating communities and ends at The Pub. Public View Tip: You definitely get a great view at both Seabreeze restaurant (make reservations)) in Redington Shores and The Pub in Indian Shores (no reservations just go early). City of St. Pete Beach Winter Festival And St Pete Beach Boat Parade Viewing Party will be held on Friday December 4th 2015 at 6pm / Dusk. Parade Route: The St Pete Beach boat parade starts at 6:00pm at the Blind Pass Bridge (in front of the St Pete Beach Community Center / Horan Park)and heads south to the Bayway Bridge. Public View Tip: Best place to see the St Pete Beach boat parade is probably going to be at Horan Park (701 Boca Ciega Dr, St Pete Beach, FL 33706) where they will also be having their tree lighting ,music, hot chocolate, face painting, and a special visit from SANTA after the St Pete Beach Boat Parade! Parade Route: This St Pete Beach Boat Parade Starts and stops at the Merry Pier (801 Pass a Grill Way.) and travels through the canals of the Vina Del Mar waterfront neighborhood. Public Viewing Tip: Easiest probably along the seawall / walk around the Merry Pier. Annual Illuminated St Pete Boat Parade will be held on December 12th, 2015 6:00 pm ( Second Saturday of December) . Enjoy one of the city’s most beautiful holiday traditions as boats festively decorated with thousands of twinkling lights sail through the Vinoy Basin and along Bayshore Drive on the downtown. Organized and presented by the Rotary Club of St Petersburg. Parade Route: The St Pete boat parade travels from Bayboro, passing in front of the Pier, near the shoreline in and around the Vinoy Basin and back out into Tampa Bay. Hillsborough River Holiday Boat Parade will be held December 13th, 2015 6:00 open to Paddlers and boaters alike. If it floats it’s welcome. Parade Route: Parade starts and boats put in at Lowry Park boat ramp at 6:00pm then the parade goes upriver with an incoming tide to the Sulphur Springs City Pool Park off Nebraska Ave.
Public Viewing Tips: The public can enjoy the boat parade at the starting location at Lowry Park or at Sulphur Springs City Pool Park (713 E. Bird St Tampa Fl) – Nebraska Avenue south of Bird St., where there’s plenty of parking, room for viewing the parade. The Channelside Holiday Lighted Boat Parade takes place on the 19th of December at 6:30pm along the water at the by Davis Island, Harbour Island and the Channelside District. Parade Route: Boat Parade goes from Davis Island, up to Curtis Hixon Park and the Children’s Museum and then back down, between Harbour and Davis Island and around to Channelside Bay Plaza! Public View Tip: Come down to Channelside Bay Plaza and enjoy the parade from the open wharf! You will be able to see the parade along the a great stretch of land from Davis Island to Channelside. Channelside Bay Plaza, located in the Channelside district of Tampa, is near downtown Tampa and easily accessible from the Selmon Expressway as well at I-4 and I-275. Parking is available at several public parking lots. . Across the street from Channelside is a multi-level parking structure. The Bay Crest Boat Parade will be held December 12th. 2015 @7:00pm The rain date is Sunday Dec 13th. Parade will start at the main entrance to the channel leading to Bay Crest Park. These Tampa waterfront neighborhoods of Dana Shores, Pelican Island and Sweetwater have their own boat parade each year. The parade typically has about 20 boats participate. 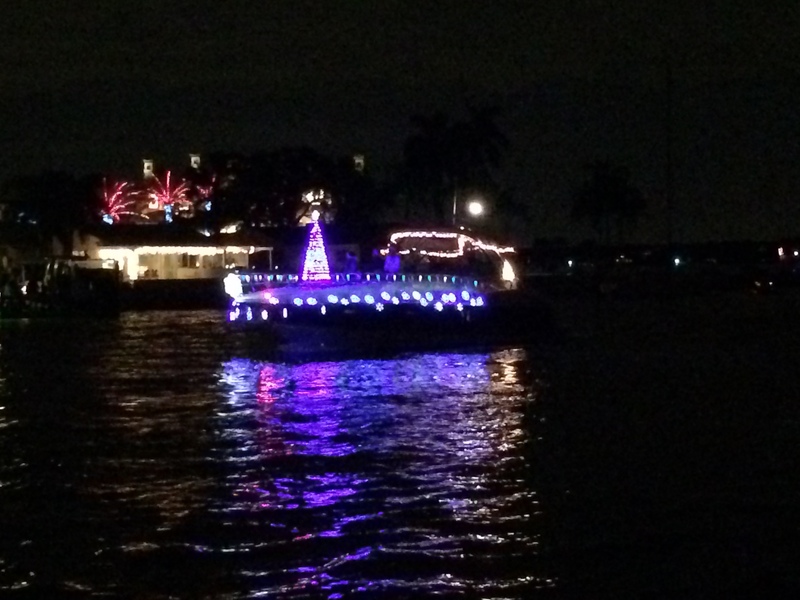 This year’s boat parade will be held on Dec 5th, 2015 and starts at 6-6:30pm. Public Viewing Tip: They begin the parade every year in the basin of Bahama Breeze so this would be a great place to see the Dana Shores boat parade. Parade Route: They will get in order in the basin from then make 1 final lap before heading to the first canal in Dana Shores (at the East end) and then going up and down every canal except the canal between Fontaineblue and Versailles because it’s not wide enough to accommodate all the boats. 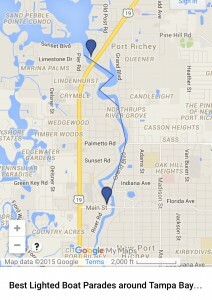 After Dana Shores they will go around Pelican Island then Sweetwater. Boat Parade Route: Boat will proceed down the Anclote River and into the bayous where Santa will give out treats to the children in Spring Bayous. The boat parade ends at Spring Bayou around 8:00 pm, as always, but we now have live reindeer, falling snow, food, vendors, carriage and hay rides and about 30,000 people! It’s expanded it a block this year, going the full three blocks from Ring Avenue to Spring Bayou and down Safford Street. The kids’ area will also have Christmas movies, as well as inflatables, games, food and a lot of fun! Public Viewing Tip: We’ve enjoyed it from the Tarpon Turtle Grill & Marina (1513 Lake Tarpon Avenue Tarpon Springs FL) Poker Run around Lake Tarpon. Hosted by the Tarpon Turtle Registration is $30 per boat with $20 of that going to Wheelchairs 4 Kids. 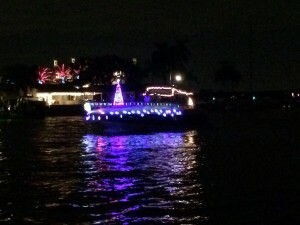 Public Viewing Tip: Best public viewing areas for the Treasure Island Boat Parade is on 115th Ave on Isle of Palms (bring your own lawn chairs); The Treasure Island Causeway Bridge, Kingfish Drive at Johns Pass (Gator’s Cafe & Saloon) and the Blind Pass Bridge (between Treasure Island and St Pete Beach) – Parking may be limited so go early or be able to walk to get there. Island Causeway Treasure Island Fl) and proceed up and down the canals of the Treasure Island waterfront neighborhoods of Treasure Island including Isle of Palms and Isle of Capri ending at Johns Pass at about 8:15pm depending on weather and number of boats. In recent years this has been one of the largest local boat parades with upwards of 50 boats. The Treasure Island Causeway Bridge will close to vehicular traffic at 7pm on December 19, 2015 for approximately 30 to 45 minutes to allow the Treasure Island boat parade to pass through. Well that sure is different and sounds like fun, boats all decorated for the holidays going up and down the canals. One of the advantages of living in Florida. Missy – it was 80 degrees here this weekend – so our holidays are definitely with a twist here. The boat parades are beautiful and I will be posting more – most of our beach communities hold them like Indian Rocks Beach, St Pete Beach, Treasure Island, and more. Dunedin held there boat parade last night – I still can’t get use to the fact that it’s already December. Sounds like Island Estates waterfront living is the place to be in the Clearwater Beach, FL. area to catch the Island Estates Yacht Club hoilday parade. Wish I could br there! We are planning to watch it from either Coachman park or from the bridge on the south side as the boats come under and head to the Clearwater Yacht Club. I can’t believe it’s here tonight. I got some photos of people decorating their boats this week. Hope to have some great shots for you. Will there be a 2008 boat parade this year? Thank you for your anticipsded response. Barbara – To the best of my knowledge the answer is “yes” – they hold it every year and a lot of people would be disappointed if it didn’t. Do you have a boat? are you planning to be a part of it or just enjoy watching others? Barbara – I don’t know the answer – it could be the weekend before too so I would check with the Island Estates Yacht club since it starts out of there they would probably have it on their calendar already. Do you know where it is located? Wonderful post. Good job. keep it up.